Mummy, Wife and Chaos: Sports luxe does a aztec midi. 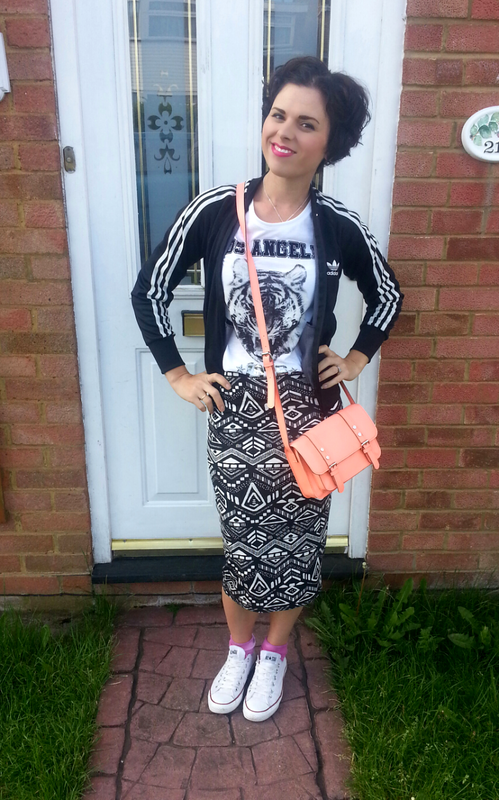 Another mixing things up look post and this time it's a sporty twist with a little help from a Adidas zip up. The T-Shirt is Next and was a must have item that I mentioned in my Next Blogger of May interview. It's fab for dressing up and down. The aztec midi skirt is New Look and again another great dress down or up item. The bag is from Tesco's Florence and Fred range that I brought with my competition winnings. They have some great pieces at brilliant prices. Don't overlook them as I've been pleasantly surprised recently. The team are also great and very kindly (unexpectedly) wrote up a grear review on my blog! Of course I'm in my fave Converse after all I needed comfy flats for my childfree day at Thorpe Park!